LOCATE Finger Lakes intern Harrison DeMaria was a participant this summer in the Idea Accelerator Program at Hobart and William Smith Colleges. DeMaria and his team recently pitched their newly established social media marketing business, HD Socials, before a gathering of fellow students, faculty, guests and Hobart and William Smith Interim President, Patrick McGuire. 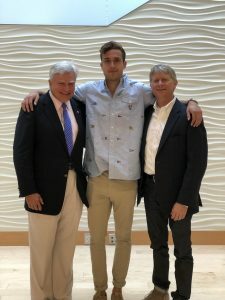 DeMaira is pictured receiving congratulations from former Senator Michael F. Nozzolio and Ed Bizari, Entrepreneur in Residence and Margiloff Family Entrepreneurial Leadership Fellow at the Colleges.